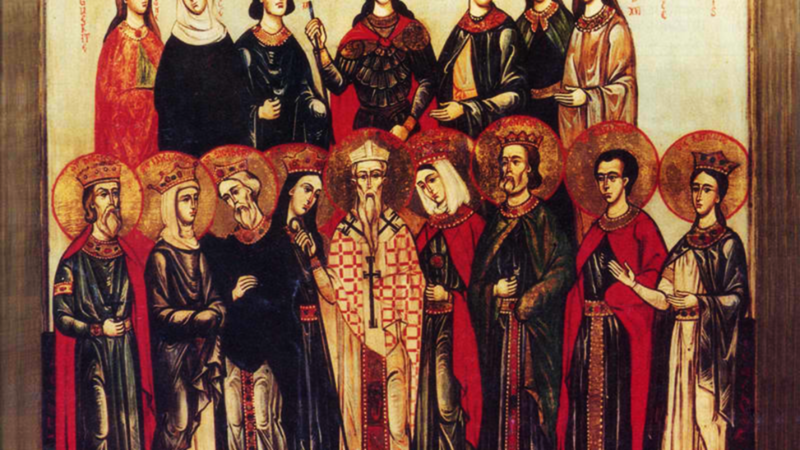 CARPOPHORUS and ABUNDIUS, St. Carpophorus, a priest and his deacon St. Abundius are amongst the many thousands who were martyred for the Faith during the Diocletianic Persecution. The location of their martyrdom (circa 290 – 300) in Rome, Spoleto, or possibly Seville, is the subject of debate. DEUSDEDIT of BRESCIA, a Bishop of Brescia, and a key figure in the Councils against Monothelitism, reposing circa 679 - 700. EULALIA, a young girl of only twelve or fourteen years of age, martyred in Mérida, circa 304 in the Diocletianic Persecution. GREGORY III, a native of Syria, whose reputation as a scholar was such, that the Romans elected him their bishop by acclimation. Serving as the ninetieth Pope of Rome from 731 until his repose in 741, St. Gregory was a vigorous opponent of iconoclasm, urging Byzantine Emperor Leo III to moderate his position during the first iconoclastic period (730 - 787), as well as convoking a synod at Rome in November 731 which condemned the heresy. Towards the end of his pontificate, St. Gregory also had to contend with threats from the Lombards. GUITMARUS, the fourth Abbot of Saint-Riquier in present-day northern France. St. Guitmarus reposed circa 765. HILDEMAR, Bishop of Beauvais in Picardy from 821 until his repose circa 844. Prior to his consecration as bishop, St. Hildemar was a monk at Corbie Abbey. JULIA of MÉRIDA, a fellow martyr with St. Eulalia (vide supra) in Mérida, circa 304. MERCURIUS and COMPANIONS, a group of Roman soldiers who were escorting Christian prisoners to their place of execution. The prisoners made such an impression upon their guards, that the soldiers were baptised. Prisoners and guards were martyred together circa 300 in Lentini, Sicily. MILTIADES thirty-second Pope of Rome from 311 until his repose in 314. Although St. Miltiades was pope when the Edict of Milan was declared by St. Constantine the Great (21st May) in 313, he is still venerated as a martyr on account of the suffering he endured during the reign of Maximian. He was also a force in the battle against Donatism, presiding over a Council in Rome (313) which condemned the heresy. SINDULF (SINDULPHUS) of VIENNE, Bishop of Vienne, and strong proponent of monasticism in his diocese. St. Sindulf reposed circa 669.